The UN Sustainable Development Goals (SDGs), adopted in 2015, - are a historic commitment to take on the world’s most pressing and intractable problems. Through the SDGs, UN Member States have agreed to address poverty, hunger, gender equity, climate change, andother global issues and to make major progress by the year 2030. Data requirements for reporting on the SDGs represent an unprecedented opportunity for countries around the world to track and evaluate their progress. SDG reporting refers to the act of publishing and disseminating data and statistics on the SDG indicators for key stakeholders, including UN custodian agencies, government policymakers, businesses, non-governmental organizations and research institutions, and the general public. 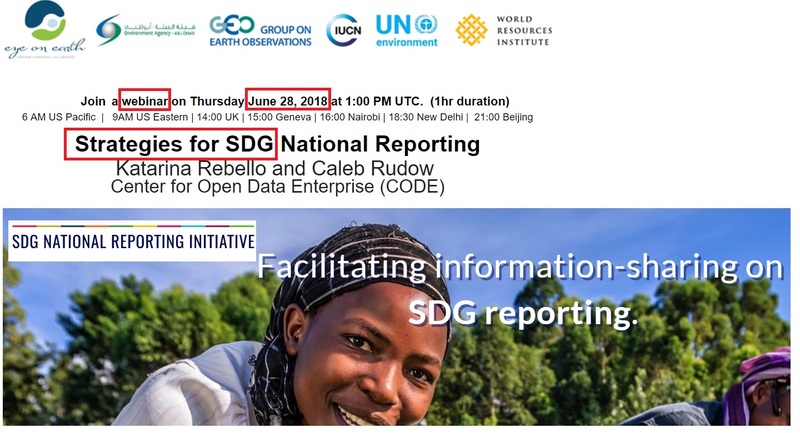 During the webinar, the presentation on Strategies for SDG National Reporting will provide an overview of current progress towards SDG reporting, strategic considerations, existing approaches and the benefits they provide, as well as country experiences from different regions around the world. All registrants will receive a link to the recording - please register even if you cannot attend the live event. In line with its knowledge exchange mission. Eye on Earth webinars are free-of-cost. Katarina Rebello is Director of Programs at the Center for Open Data Enterprise where she oversees federal and international programs. Caleb Rudow is a Research Fellow at the Center for Open Data Enterprise where he and works on the SDG National Reporting Initiative. *** Please share this invitation to relevant members of your professional and institutional networks.